At the Farmers’ Market they sell purple sweet potatoes of a couple varieties – Okinawaan and Molokai. Being enticed by their lovely color, I brought some home and then they sat on the counter. I love slow roasted potatoes in the oven. I’ve done red potatoes with rosemary, garlic and olive oil but wanted something different for these purple cousins. Something about sweet potato fries kept coming to mind. And there is a bar in Minneapolis that has an amazing curried mayo dipping sauce for their fries. Thinking of flavors that go well with curry led me to cumin and, let me tell you, cumin is the way to go! 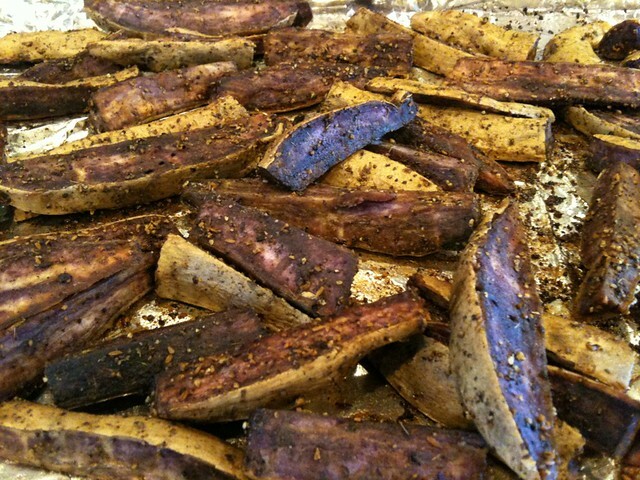 Cut into wedges, these sweet potatoes love cumin! Add a bit of black pepper, salt and a touch of onion flavor and you’ve got a winning home-made steak fry. Whip up a little curried mayo dip (get creative with it!) and this is a crowd pleaser for sure! You could serve these while watching football (I hear people do this in the fall, yes?) or nosh on them while watching Mad Men episodes (much more my style!). Make some sandwiches (that is an open-faced tuna melt in the pic) and you’ve got a meal! Do give these potatoes a try. Despite the number of steps in the recipe, this is something that can be made in the background, while you work on other things (food-related or not). And if you don’t have purple sweet potatoes, don’t worry. I’m sure these would be fine with most kinds of potatoes – use what you’ve got laying around or try a new variety. I’m sure you’ll be sold on these. I know I was! Wash and trim ends from the potatoes. 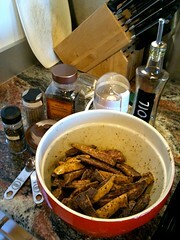 Cut them into wedges (think steak fries) and rinse twice in cold water. 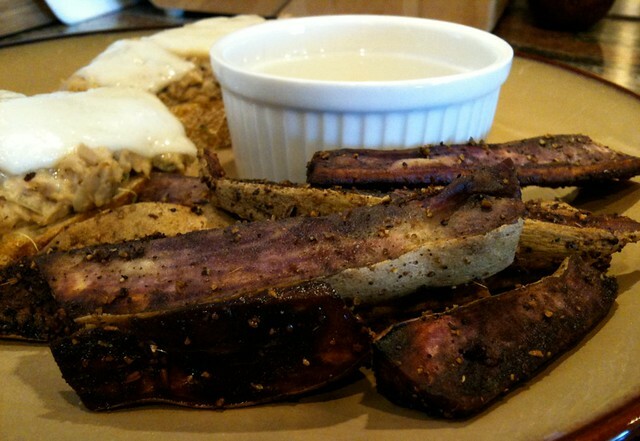 Soak the cut and washed potato wedges in enough water to completely cover them. Add about 1 tsp. of sea salt to the water if you remember. Leave them alone for up to an hour. Meanwhile, in a coffee grinder (I have one I use just for spices) add the peppercorns, cumin seed, and salt. Grind until fine, then add the ground cumin and onion powder. Pulse to combine. Preheat the oven to 400ºF, and let the potatoes sit in the oil and spices until the oven is hot. Dump the potatoes onto a rimmed baking sheet lined with foil (to make clean-up easier) and roast for about an hour, or until soft on the inside, and browned and slightly crispy on the outside. While the potatoes are roasting, make the dip. Combine all ingredients in a small bowl. Taste, and adjust seasoning. Feel free to play around with this. Add more curry powder if you like. Add a little more salt (it really brings out the other flavors!) and pepper. You could add a few drops of lemon or lime juice if you have some handy. Substitute sour cream for the yogurt, or do it all with mayo if you prefer. Just be sure to keep tasting it until you like what you’ve created. This entry was posted in Appetizers, Sides, Vegetables and tagged cumin, curry, mayonnaise, potatoes. Bookmark the permalink.